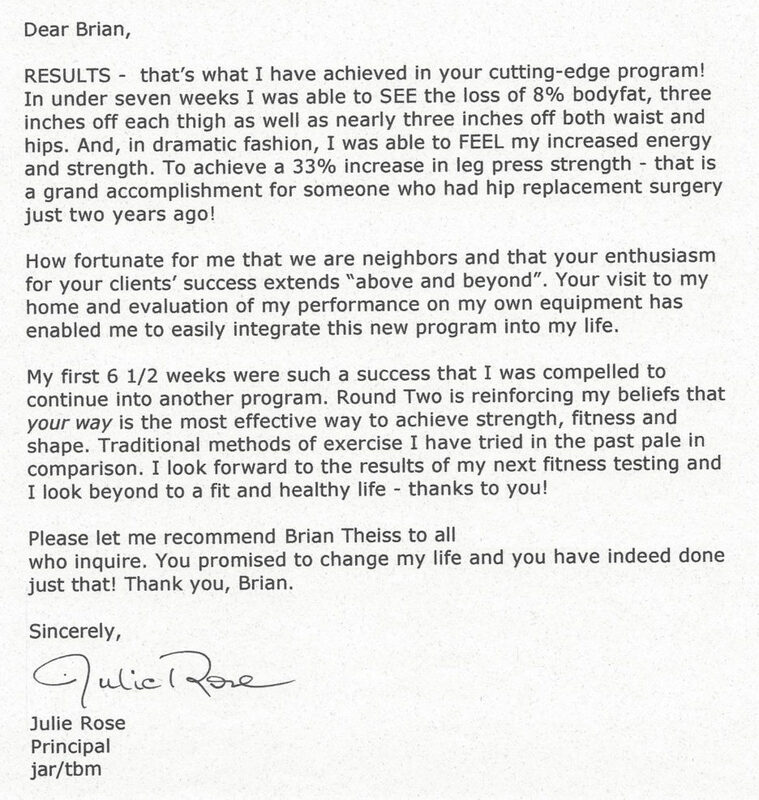 RESULTS – that’s what I have achieved in your cutting-edge training program! In under seven weeks I was able to SEE the loss of 8% body fat, three inches off each thigh as well as nearly three inches off both waist and hips. And, in dramatic fashion, I was able to FEEL my increased energy and strength. To achieve a 33% increase in leg press strength – that is a grand accomplishment for someone who had hip replacement surgery just two years ago! How fortunate for me that we are neighbors and that your enthusiasm for your clients’ success extends “above and beyond”. Your visit to my home and evaluation of my performance on my own equipment has enabled me to easily integrate this new training program into my life. My first 6 1/2 weeks were such a success that I was compelled to continue into another program. Round Two is reinforcing my beliefs that your way is the most effective way to achieve strength, fitness and shape. Traditional methods of exercise I have tried in the past pale in comparison. 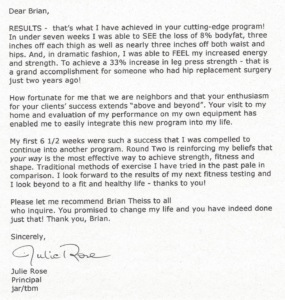 I look forward to the results of my next fitness testing and I look beyond to a fit and healthy life – thanks to you! Please let me recommend Brian Theiss to all who inquire. You promised to change my life and you have indeed done just that!